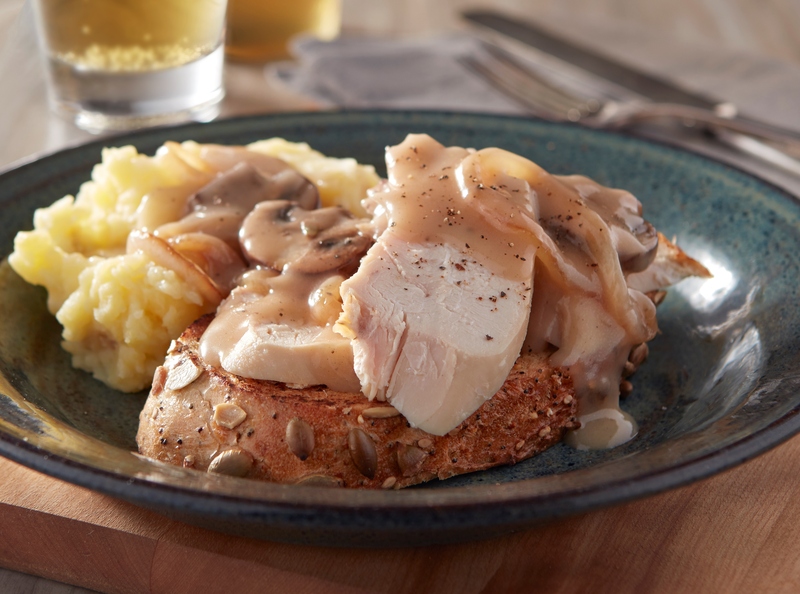 There’s not much more comforting than hot chicken sandwich doused with a creamy gravy alongside a big spoonful of chunky smashed potatoes fragrant with garlic. Place potatoes and garlic in large saucepan; cover with water. Bring to a boil; reduce heat and simmer about 20 minutes or until tender. Drain well. Using a fork, begin mashing potatoes and garlic in a bowl with 1 tablespoon butter. Add buttermilk and mash to desired consistency; season with salt and pepper. Keep warm. Meanwhile, heat oil in large skillet over medium-high heat. Add onion; sauté about 4 minutes. Stir in flour; cook until lightly browned. Gradually whisk in broth until smooth; stir in Worcestershire and simmer about 3 minutes or until thick. Spread bread with mustard; top with chicken, spoon gravy on top, and sprinkle with parsley. Serve with potatoes.